alaTest has collected and analyzed 918 reviews of Apple iMac 27-inch Mid 2011 (MC813, MC814, Z0GF). The average rating for this product is 4.4/5, compared to an average rating of 4.2/5 for other Desktops for all reviews. Reviewers really like the size and reliability. The price and design are also mentioned favorably. We analyzed user and expert ratings, product age and more factors. Compared to other Desktops the Apple iMac 27-inch Mid 2011 (MC813, MC814, Z0GF) is awarded an overall alaScore™ of 95/100 = Excellent quality. 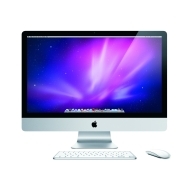 alaTest has collected and analyzed 85 user reviews of Apple iMac 27-inch Mid 2011 (MC813, MC814, Z0GF) from Amazon.co.uk. The average user rating for this product is 4.4/5, compared to an average user rating of 4.2/5 for other Desktops on Amazon.co.uk. Opinions about the size and price are on the whole positive. The design and usability also get good feedback. Some have doubts about the reliability. alaTest has collected and analyzed 272 user reviews of Apple iMac 27-inch Mid 2011 (MC813, MC814, Z0GF) from Amazon.com. The average user rating for this product is 4.5/5, compared to an average user rating of 4.0/5 for other Desktops on Amazon.com. People really like the size and reliability. The price and design also get good opinions. The design, including thick screen bezels, feels dated. UHS-II SD cards still aren't fully supported. The tilt-only screen doesn't offer enough adjustment options. It's something of a miracle that Apple can continue to cram newer (and hotter) components into the tiny space behind the iMac's screen, but we're already ready for a bigger redesign. With the current Apple iMac approaching its first birthday, does it still prove desirable against the latest slew of Windows all-in-ones? We recommend Apple's new 27-inch iMac to digital media editors and others with serious performance needs on the strength of its impressive speed, its connected device potential and its market-leading 27-inch display.